so many kaffeehausen, so little time | tasty treats! The second day in Vienna (see here for the post on the first day) began without breakfast – the first thing to hit my palate was a supremely rich sacherpunsch (which is essentially a sachertorte, with the exception that the usually dry cake is soaked in rum) and a strong espresso at L. Heiner, a professed favourite of my extremely knowledgable tour guide. Highlights of the day included nipping quickly through the Naschmarkt (Vienna’s most famous food market, which also hosts a flea market on Saturdays; more on it later) and ending up at Café Drechsler. This old-timer, established in 1919, was a popular haunt of marketgoers and stallholders alike (it only closed for one hour every day, from 2am-3am). 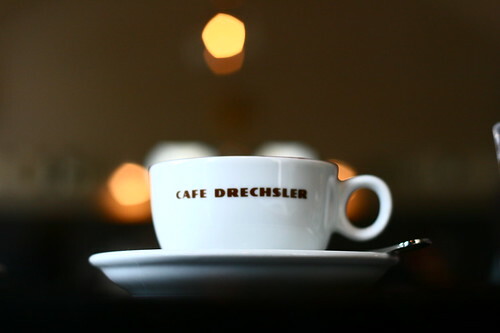 So connected were the market regulars to the kaffeehaus that Herr Drechsler himself would bring coffees to them, every day without fail, so they would not have to leave their stalls. It closed several years ago, but was rescued and given a new lease of life thanks to the joint efforts of Manfred Stallmajer and Sir Terence Conran. A regular himself in his younger years, Stallmajer would simply and thriftily order a simple melange until, coerced by a grumpy Drechsler, supplement it with a goulash. To him, it would have been a shame for the space left by the closure to go to a brand like McDonalds or Starbucks (snaking their way around the city, slowly but surely) so he took it into his own hands to relaunch the café. 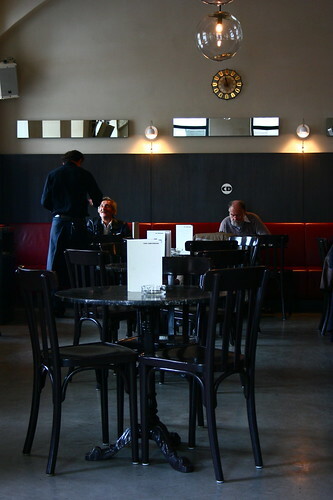 The aim was simple – to hold onto the principles of the kaffeehaus while bringing it more in line with the 21st century (a manifesto that was, of course, met with criticism and scepticism); anything which was original to the restaurant must be kept, unless it was proven to be beyond repair. The chairs and timber wood panelling were meticulously restored, and some of the original bauhaus fittings (such as the lights) were also kept, though placed differently. The original ceiling of the building was also kept, after stripping away thick decades of yellowed wallpaper (apparently the layers just kept going on one after the other whenever the most recent layer got too stained). Shiny new mirrors have been put in, and distinctively modern transparent light fittings installed in place of the heavy globes that dominate most kaffeehausen. It felt worlds apart from many of the other traditional kaffeehausen I visited, yet not. The patrons were not, as expected, hipsters or yuppies attracted by the rebranding (though there were a few), but a few gentlemen who looked like comfortable old-timers. These little details, coupled with the ever so subtle ‘upgrades’ of materials and fabrics and combined with the essential air of the café means that the spirit of the kaffeehausen is not lost. Entry filed under: cafe, travel. 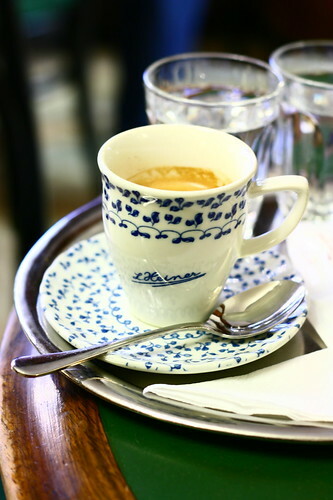 Tags: coffee, kaffeehaus, vienna. Beautiful photographs, captured the essense of the cafe, loved the last one with the man smiling in the background! God, it’s annoying how the column of my wordpress column is 50pixels shorter than the width of my pictures…making everything look off centre! I am getting travel envy from reading this Charmaine. The cafe culture in Vienna really is brilliant. 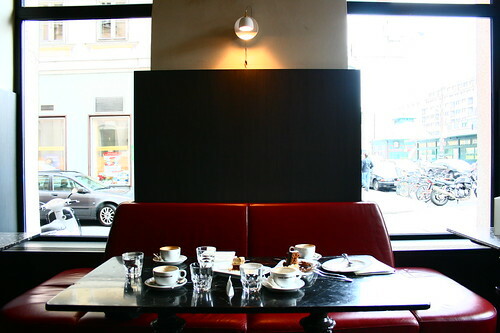 Did you make it to Zum Scharzen Kamel (The Black Camel) at all – really amazing Viennese style tapas. I know that sounds quite strange but it was actually very good.